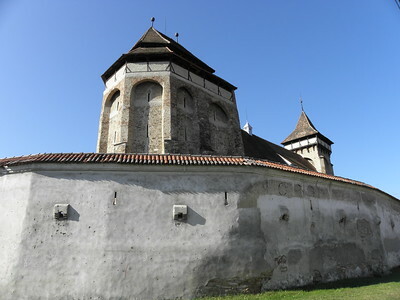 The Villages with Fortified Churches in Transylvania are examples of defensive vernacular architecture made by Saxon settlers. They date from the 13th to the 16th century. 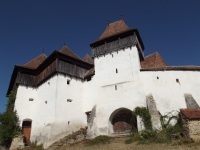 Transylvanian villages were often organised around a fortified church, to protect them from invading Mongols and Turks. 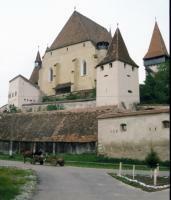 There are 200-250 villages with fortified churches in Transylvania. You'll pass several of them on your way to one of the 7 WHS designated villages. They are scattered along the main roads between Sibiu and Sighisoara, and Sighisoara and Brasov. Every village has the typical small, brightly coloured houses and a bulky and sometimes oddly shaped church. The names of the towns are posted in German too. It's a pleasure just driving around and looking out for them. First I visited Valea Viilor (Wurmloch). There's a big sign to it from the main road. Four km along a winding country road took me to this town, original in its Saxon lay-out with one long street ending at the church. Construction workers were busy with the tower. Their head man doubled as museum/church keeper (or is he the keeper who needed to oversee the reconstruction?) and welcomed me in German. There's an oval compound here within the walls (6-7 m high). There's lots of room for storage behind these walls. The interior of this church is relatively simple. All Biblical quotes displayed are in German. Biertan is the best known of these villages, and the one originally inscribed in 1993. It's also the most popular with tourists; it has souvenir stalls and a book shop. Entrance is 6 Lei (1.5 EUR). The structure here is large, like a citadel. You enter via a long wooden staircase. At the top of the hill there are a number of towers, each with its own design and function. The church here has a more elaborate interior, including a prize piece altar. Lovely site, with good views over the surrounding countryside! P.S., in answer to Paul Tanner's observations from 1999 below: the horse drawn carts are still a common sight here but all the main roads are paved now. Of the five I found Viscri to be the most interesting and attractive, although I also liked the bottle glass windows of the Biertan church. I saw three on a recent visit, and the best one was in Viscri. Although the road to the town is now paved, it is still a bit of a pain to get there. Once there, especially during the low season, one has to look for the old lady who keeps the keys to the church. Inside is fantastic: a modest church, a neat fortress layout, and a creaky tower/lookout. The hunt for the old lady was the best part as we were able to interact with locals, and she also showed a few things here and there we would have missed. It is true that the area is littered with fortified churches. The ones listed bu UNESCO are fine, but I suggest really hiring a car and going out to explore. Copsa Mare, for example, is only 2km from Biertan, and has a creaky old church in a nice compact little town right in a middle of a small valley. This site is strictly described as “Villages with fortified Churches” rather than purely the churches themselves. In all honesty the Churches are the main attraction although some of the villages possess a rural charm. The Fortified Churches of Transylvania are not as impressive in my opinion as the Painted Churches of Bucovina but are still well worth seeking out whilst you are in the area seeing the WHS town of Sighisoara and the Dacian Fortresses of the Orastie Mountains. (This is a great “hot spot” area for WHS! In fact Romania as a whole is greatly undervalued I feel as European destination which is full of interest and, apart from the Danube Delta possibly, its 7 WHS are relatively easily accessible). Between Sigishoara and Sibiu there is an area which was settled by Saxons in the 12th century. Facing threats from the Turks in 15th and 16th centuries these people fortified their churches into veritable castles with high walls around them. The area in fact remained primarily Saxon until as recently as the demise of communism when many took the opportunity to emigrate to Germany and this has placed the churches in a parlous position which WHS inscription might assist. In fact only 7 churches are actually inscribed although many more are in existence. It is part of the “fun” of a tour of the area to search them out. Many are in poor condition and seemed to be unused behind their enormous walls. Biertan (photo) is possibly the most impressive/famous and was the only one we actually managed to get inside. It is cavernous and a bit stark but there are fine views of the village and the walls from “up there”! When we were there in 1999 the village was still wonderfully rural. Its dirt track gravel streets, flanked by solid Saxon houses, were busy with horse drawn carts and waddling geese – a time warp which, no doubt, is already changing as Romania emerges from the ravages of Ceaucescu’s era and prepares for membership of the EU. Teutonic Knights: In 1211, when forced out of Holy Land, they were encouraged to settle in Transylvania. They were kicked out 14 years later but many "German" settlers stayed. "The largest fortified church in southeastern Europe, Prejmer (Tartlau in German) was built by Teutonic knights in 1212-1213"
Prince Charles: He owns a house in the village of Viscri and,in line with his interest in preservation and the natural environment, he is a patron of the Mihai Eminescu Trust (a UK charity set up to restore the cultural heritage and skills of the area's Saxon villages).